I’ve been planning a massive closet purge for a while now. 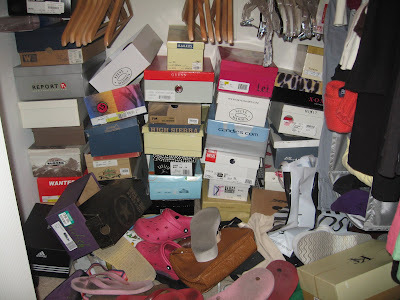 Saturday I set a goal to get rid of 20 pairs of shoes. I am a shoe girl. I did it. It wasn’t even hard, and I actually got rid of 21 pair. Way to over achieve huh? I took pictures, and I’m going to tell the tales of the favorites among the scorned. I haven’t decided yet if it should be one massive post or if I should spotlight a pair here and there. In any case, I don’t have the motivation to do any of it tonight.